Farewell to Estee Chan, our lead artist – Zombies, Run! This week, we’re saying goodbye to our lead artist, Estee Chan. Estee joined Six to Start five years ago and she’s worked on some of our biggest and most ambitious projects – The Code, The Walk, Step Buy Step, and of course, Zombies, Run! Seasons 1 to 4. I can’t overstate how influential Estee has been for Zombies, Run! 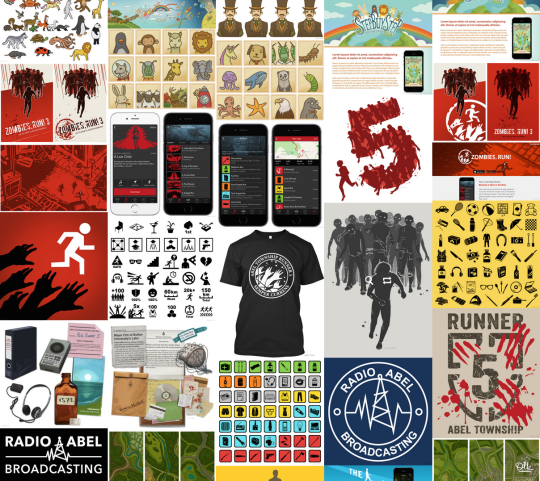 – practically every icon, logo, illustration, design, banner, poster, and T-shirt was created by her, including our distinctive red/black/white visual identity. We’ve asked Estee to do so much in so many different media, and she’s always risen to the task. On a personal note, Estee has been a delight to work with, and in this business, that’s really important. Estee is moving to Japan, but we intend to stay in touch – and if you are in need of a fantastic freelance graphic designer and artist, we can’t recommend her more highly. Check out her portfolio! …and welcome to Kascha Sweeney! We’re also welcoming a new artist to Zombies, Run! and Six to Start, and if you haven’t heard her name, you’ve definitely seen her Tumblr: The Wondersmith. Kascha caught our eye years ago as one of the most talented and prolific fan artists out there, and we first worked with her on The Walk, where she drew and painted some truly beautiful maps. We’re really looking forward to working with Kascha on Zombies, Run! Season 5 – carrying the flame of what Estee established, and bringing it into 2016 and beyond. Kascha will also be working on an exciting new art-rich project that we’ll be announcing soon!